The Army has West Point. The USAF has the USAF Academy near Colorado Springs, Colorado. I was a cadet there from June 1972 to June 1976, which means I was a freshman there from June 1972 to June 1973. The Army and the Navy calls their freshmen Plebes. The USAF Academy has Doolies, also called Smacks if the upperclassman is trying to be a bit insulting. As a Doolie, you learn how to move about, eat, and drink at attention. Always on the lookout for an upperclassman. And the upperclassmen will harass you. It is kinda like a fraternity rush week every day. Except during Hell Week in the spring when it is a bit more intense. And I am not exaggerating about eating at attention. That is how we did it. 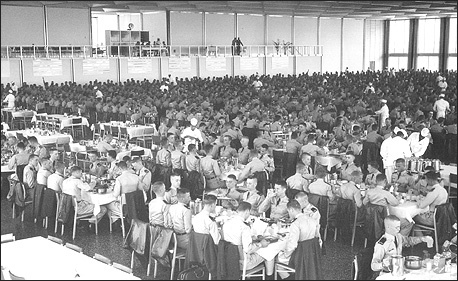 Doolies would run to our place in formation, following strict 90 degree corners, march in formation to our banquet hall (Mitchell Hall), and join a table of 10 cadets. A single table of 10 cadets would usually have 3 Doolies and roughly equal amounts of the 3 upper classes, all aligned by rank. Each table had a table commandant who you would direct your requests to. “Sir, would any cadet care for more chicken?” you might say, if you wanted seconds. 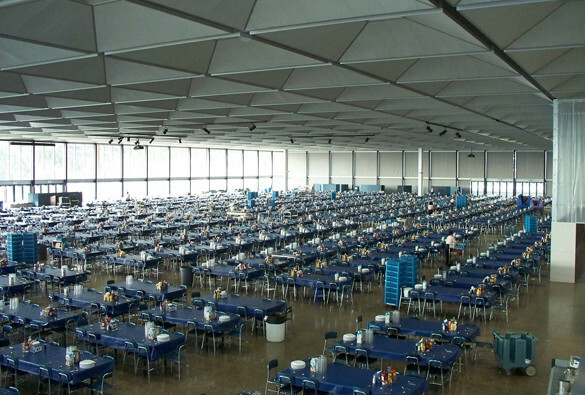 Mitchell Hall can seat well over 4,000 cadets for a meal. Eating and drinking was performed in silence, unless spoken to, and sitting at attention with your chin shoved into your neck and shoulders “back and down”. Extreme good posture. Eyes down at your plate. A favorite passtime for upperclassmen at a meal would be to challenge a Doolie to a debate. The upperclassman might say: “Hey, Vono! Yeah! You Mister!” If he was trying to not be too insulting. Or the debate might be on airpower efficacy in WWII. Or perhaps our chances for winning the next football game. But the key was the upperclassman’s willingness to pick a subject and then have the Doolie pick the side he wanted to debate. This kind of arguing was a bit startling to me. But I guess it taught me a few things. You can hold your own even if you are the lower rank and at attention, if the superior officer is not a complete jerk. You can debate and argue a point with a superior and not have hurt your relationship. The important element was whether you had good points and delivered them well. It is very important to learn how to argue without getting rattled. It also showed you which upperclassmen were real jerks and which had some idea of leadership skills and how to exercise them.